This strange yet interesting Australian drama revolves around a group of friends who are on a journey within the Blue Mountains to find a tree called the wollemi pine and perhaps a key to immortality. This premise also holds true for the characters who are 20-something people and already believe themselves to be immortal. 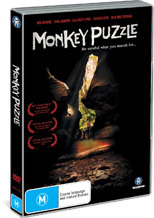 Monkey Puzzle is directed by Mark Forstmann who truly creates a powerful movie for his directorial debut and focuses on the flaws and key aspects of friendship. Although the story may be clichéd, it's hard not to get drawn into this tale thanks to the wonderful Australian cinematography which is truly outstanding plus some outstanding acting performances, especially Ryan Johnson. When the tale starts to go wrong, each of the individuals deals with the situation differently and emotions become high. It's a movie that has to be seen without spoiling the end, quite a gripping movie from start to finish!